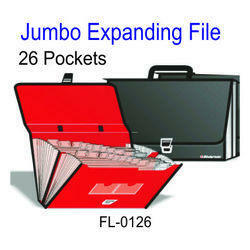 We are one of the leading traders and suppliers of expanding file. These are available in various exclusive designs, striking colors and latest patterns with perfect finish. The offered files are highly appreciated by our clients due to their high quality, excellent durability and light weight. We are looking for South India queries. 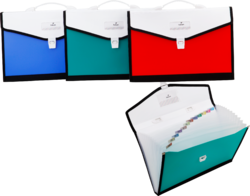 it's a polypropylene system with different sections to carry files, important documents, certificates, etc with index tag so as to access them fast. Ideal for executives, marketing staff's & students. We can provide kinds of office supplies, our office files are of good quality and reasonable prices. Here is our expanding file with A4 sheet. If you click the icons below this picture, you will turn to other similar products pages. They are for different office uses. Welcome to choose upon your needs.